This course has three basic goals. First, it is an introduction to the politics of U.S. environmental policy making. We explore how conflicting political, economic, and social interests and values contend for influence and exert power in the realm of environmental policy. We look at the ways in which local, regional, and national governmental institutions, non-governmental organizations and interest groups, and the public interact in defining environmental problems, and formulating and implementing solutions. Second, we investigate how, where, and when science and engineering enter the environmental policy process and how they compete with other, frequently more powerful, policy-shaping forces. The cases illustrate how politics often dictates acceptance of tradeoffs and compromise among divergent values and interests, where purely science-based and engineering-based analyses would suggest more 'elegant' solutions. In essence we try to explain how and why solving real-world environmental problems differs from solving engineering problem sets. Third, the course explores how applying different analytic frameworks--or, conceptual lenses--to view a given environmental problem can produce very different perceptions of the problem and its solutions. If market economists and radical ecologists both understand the same science, why are their solutions so different? Criteria for HASS CI Subjects: Communication intensive subjects in the humanities, arts, and social sciences should require at least 20 pages of writing divided among 3-5 assignments. Of these 3-5 assignments, at least one should be revised and resubmitted. HASS CI subjects should further offer students substantial opportunity for oral expression, through presentations, student-led discussion, or class participation. In order to guarantee sufficient attention to student writing and substantial opportunity for oral expression, the maximum number of students per section in a HASS CI subject is 18, except in the case of a subject taught without sections (where the faculty member in charge is the only instructor). In that case, enrollments can rise to 25, if a writing fellow is attached to the subject. The course is organized into lectures and recitation sections. There will be two weekly lectures each of 1-1/2 hours duration. The lectures will delve into the primary topic for the week, covering theoretical and analytical issues as well as the substantive questions raised in the reading material. In particular, the lectures will emphasize alternative ways of examining a given topic. Students are encouraged to ask questions and offer comments in lecture class. There will be a weekly recitation session of 1 hour, with several sections to choose among. The recitation sections will explore lecture and reading topics in greater detail, provide the opportunity for broad discussion among the students, and correct the mistakes made in lecture class by the lecturer. Some recitation sessions will focus more explicitly on topics implied, but not directly covered, in the lectures. No recitation section will have more than 18 students. Layzer, Judith A. The Environmental Case. Washington D.C.: CQ Press, 2002. Switzer, Jacqueline Vaughn. Environmental Politics. Wadsworth Press, 2001. (2) Students are also required to follow environmental news by monitoring the GREENWIRE news service. GREENWIRE can be accessed from any computer with an MIT IP address at http://www.greenwire.com. All the readings assignments relevant to a given week's class discussion must be read prior to that class. Students are required to attend both the weekly lectures and a weekly recitation. Failure to regularly attend lectures and recitation sections will result in automatic failure of the course regardless of other grades. Regular attendance means no more than one unexcused absence from lecture or one unexcused absence from recitation section. Both lecture and recitation section will involve extensive student oral participation, commenting, questioning, and probing arguments and ideas. Students will be required to prepare one or more oral presentations for lecture/recitation class. Specific due dates for each paper are noted in the syllabus and late papers will be reduced 1/2 grade per day. Three-hour short-answer final exam, given during final week. Part I: The Environment as a "Problem"
This introduction to the course reviews the evolution of environmentalism in the U.S. since the colonial era. Switzer. Environmental Politics. Pp. 1-32. Muir, John. "Hetch Hetchy Valley." Pinchot, Gifford. "Principles of Conservation." Kraft, Michael E., and Norman J Vig. "Environmental Policy from the 1970s to 2000." The Environmental Impact of Human Activity: Is there a Problem? We begin with a very basic question: How severe are the environmental problems we are facing? Is the earth facing a looming environmental catastrophe? These authors believe we are approaching a planetary crisis. Meadows, et al. "The Nature of Exponential Growth." Hardin. "The Tragedy of the Commons." Arrow, et al. "Economic Growth, Carrying Capacity, and the Environment." Perhaps we have passed the peak of the environmental crisis. Are we already well on the way to balancing environmental, economic, and societal needs? Simon, and Kahn. "Introduction to the Resourceful Earth." Ehrlich, and Ehrlich. "Wise Use and Anti-Environmental Science." Switzer. Environmental Politics. Pp. 273-294. Baden, John, and Douglass Noonan. Managing the Commons. This is an interesting critique of the "Tragedy of the Commons" thesis and suggested free-market solutions. Ostrom, Elenor. Governing the Commons. A strong critique of Hardin's thesis. Population Action International. People in Balance. Easterbrook, Gregg. A Moment on Earth. Who are the key players in environmental policymaking? How does the environmental policymaking process work? Switzer. Environmental Politics. Pp. 35-92. Layzer. "Introduction." In The Environmental Case. Pp. 1-24. Vig, Norman J. "Presidential Leadership and the Environment: From Reagan to Clinton." Kraft, Michael E. "Environmental Policy in Congress: From Consensus to Gridlock." McSpadden, Lettie. "Environmental Policy and the Courts." Part II: 1970-1980: Let the Government Do It! The government had to do something about America's unbreathable air. And it did: the Clean Air Act of 1970. Congress set air standards, set deadlines, and ordered the air to be cleansed. This class examines the driving forces behind the rise of environmental legislation that poured out of the Congress beginning in 1970s. The legislative surge in American environmentalism--the Clean Air Act and the Clean Water Act in particular--ushered in an era of "command and control" regulation setting the stage for political conflict between private enterprise and the public interest. Layzer. "The Nation Tackles Pollution: The EPA and the Clean Air and Water Acts." In The Environmental Case. Pp. 25-51. Schmandt, Jurgen. "Regulation and Science," Science, Technology, and Human Values." Bartlett. "Rationality and the Logic of the National Environmental Policy Act." Switzer. Environmental Politics. Pp. 189-212, 311-316. Legislation Link: Clean Air Act. Portney, Paul R. "The Evolution of Federal Regulation." Greve, and Smith. Environmental Politics: Public Costs, Private Rewards. Chap. 2. Torgerson. "Limits of the Administrative Mind." The Clean Water Act of 1972 was supposed to make all the waters of the U.S. clean by 1985. What happened and why? Congress, concerned that government environmental agencies might become "captive" of the very industries they were supposed to monitor and regulate, put citizen enforcement provisions in the Clean Water Act. Quickly, environmental litigators and the courts became major players in environmental policy. Switzer. Environmental Politics. Pp. 159-188. Greve, Michael. "Private Enforcement, Private Rewards: How Environmental Citizen Suits Became an Entitlement Program." Legislation Link: Clean Water Act. Freeman, A. Myrick, III. "Water Pollution Policy." This class explores how the reach of a law can expand beyond what its original creators intended. We look at how a series of court cases broadened the jurisdiction of the Clean Water Act and forced the US Army Corps of Engineers to protect wetlands--and then two decades later forced it to "unprotect" them. Williams, Ted. "Who can Save a Wetland?" Americans have always had a schizophrenic "environmental" attitude toward wildlife and the landscape. An unstable mix of values:--romanticism, utilitarianism, dominionism (fear), and liberty (common property ownership)--has made preservation and protection of America's natural landscape a policy rife with internal contradictions, reversals, and too-little too-late reactions. The Endangered Species Act (1973) suggests that American policy-makers were prepared to make tough decisions favoring biodiversity over the economy. Was this true? And if so, how do we explain it? We also explore the role of the courts in environmental policy making. Wilson, E. O. "The Current State of Biological Diversity." Mann, Charles, and Plummer. "The Awful Beast is Back." Legislation Link: Endangered Species Act. Leopald, Aldo. "Thinking Like A Mountain." Kellert, Stephen. The Value of Life. Chap. 2 and 3, pp. 9-63. This lecture examines how mass politics extended the environmental mandate, bringing about stringent regulations and standards for hazardous waste control. What mobilizes public participation in environmental policy and how does that participation affect policy? How does the public grapple with complex scientific and technical issues? How do government and media organizations respond to public pressures? Layzer. "Love Canal: Hazardous Wastes and the Politics of Fear." In The Environmental Case. Pp 52-77. Switzer. Environmental Politics. Pp. 113-138. Downs, Anthony. "Up and Down with Ecology: The Issue-Attention Cycle." Greve, and Smith. Environmental Politics: Public Costs, Private Rewards. Chap. 4. Layzer. "Government Secrets at Rocky Flats." In The Environmental Case. Pp. 78-101. The Reagan administration comes to power critical of "big government" in general and government regulation in particular--especially environmental regulation. Arguing that environmental regulation was hobbling the economy the administration tried to dismantle the environmental framework that had been established the previous decade. 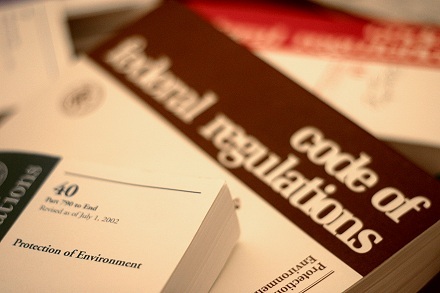 One of its more lasting efforts was to require cost-benefit analysis for environmental regulations. Whittington, Dale, and W. Norton Grubb. "Economic Analysis in Regulatory Decisions." Farrow, Scott, and Michael Toman. "Using Cost-Benefit Analysis to Improve Environmental Regulations." Eads, George. Environment 41, 4: 4. Lave, Lester. Environment 41, 4: 4. Farrow, and Toman. 41, 4: 45. Grunwald, Michael. "How Corps Turned Doubt Into a Lock." General dissatisfaction with big government and the seeming stagnation of environmental policy opens the door for advocates of economic mechanisms to guide environmental policy choices. Markets, taxes, subsidies, etc. can be employed to elicit voluntary environmentalism. Layzer. "Market-based Solutions: Acid Rain and the Clean Air Act Amendments of 1990." Chap. 11 in The Environmental Case. Pp. 264-288. Anderson, and Leal. "Visions of the Environment and Rethinking the Way We Think." Mitchell, and Simmons. "Political Pursuit of Private Gain: Environmental Goods." Goodin, Robert E. "Selling Environmental Indulgences." Freeman, A. Myrick, III. "Economics, Incentives, and Environmental Regulation." Greve, and Smith. Environmental Politics: Public Costs, Private Rewards. Chap. 2 and 5. Weber, Edward. "Assuring Reductions in Acid Rain: The Case of Government Imposed Markets." There can be no doubt that 30 years of environmental policy has lessened the pollution burden on the nation, slowed the loss of ecological communities and species, and improved our quality of life. But not all Americans have benefited equally. Some Americans--minorities and the poor, in particular--may have enjoyed no benefit at all. Is this "unfair" distribution of environmental benefits just an artifact of policy or does it reflect racial and class biases in our society? First National People of Color Environmental Leadership Summit. "Principles of Environmental Justice." Bullard. "Anatomy of Environmental Racism." Krauss. "Women of Color on the Front Line." Friedman, David. "The Environmental Racism Hoax." Rinquist, Evan J. "Environmental Justice: Normative Concerns and Empirical Evidence." This lecture explores the rise of anti-environmentalism in the western revolt against federal control of public lands and its spill over to environmental policy in the rest of the country. It investigates relationships among the Presidency, Congress, federal agencies, and interest groups and how those relationships determine public lands policy. Focus on the collision between public and private interests and values. Layzer. "Federal Grazing Policy: Some Things Never Change." Chap. 6 in The Environmental Case. Pp. 127-154. Layzer. "Jobs vs. the Environment: Saving the Northern Spotted Owl." Chap. 7 in The Environmental Case. Pp. 155-182. Switzer. Environmental Politics. Pp. 93-112, 243-272. Risk assessment is an important tool in environmental policymaking. We examine its use in providing safe drinking water. We look at how public information and collaborative/voluntary approaches can reduce environmental risks and improve environmental quality. Arsenic Rule Benefits Analysis: An SAB Review. Putnam, Susan W., and Jonathan Baert Wiener. "Seeking Safe Drinking Water." Schleicher, David. "How Does Science Matter?" Andrews, Richard N. L. "Risk-Based Decision-Making." Lee. "The Columbia River Basin: Experimenting with Sustainability." This class focuses on suburban "sprawl" and its impacts on landscape: development, habitat fragmentation, etc. Sierra Club. Sprawl: The Dark Side of the American Dream. Layzer. "Backlash: Wise Use, Property Rights and the Anti-Environmental Movement." Chap. 10 in The Environmental Case. Pp. 238-263. Stoel, Thomas B., Jr. "Reining in Urban Sprawl." To this point our discussions have looked at environmental policy as conceived and implemented by national and state governments. Some argue that the "next wave" of progress in environmental policy will be place-based local environmentalism. Layzer. "Local Collaboration & Compromise: Using Habitat Conservation Plans to Save Southern California's Endangered Landscape." Chap. 13 in The Environmental Case. Pp. 319-347. Knopman, Debra S., Megan M. Susman, and Marc K. Landy. "Civic Environmentalism." Sagoff. "The Allocation and Distribution of Resources." Paehlke. "Environmental Values for a Sustainable Society." Ophuls, and Boyan. "The American Political Economy." Harrison, Kathyrn. "Talking with the Donkey: Cooperative Approaches to Environmental Protection." For the past few months we have looked at how institutions, interest groups, elected officials, etc. define and shape solutions to US environmental problems. In this lecture we look briefly at other countries and their experience with acid rain. We consider whether different political institutions result in different outcomes, or if cultural, economic, or demographic factors are more important for explaining differences among national environmental policies. Boehmer-Christiansen, Sonja, and Jim Skea. "Government, Politics and Environmental Policy-making." ------. "Forests and Power: German Precaution." Cheap energy drives the American economy; indeed, it drives the global economy. But cheap energy carries a heavy environmental price tag. Extracting fossil fuels despoils the landscape. Burning fossil fuels pollutes the air. Hydropower devastates river ecology, while nuclear power leaves deadly wastes behind. How do we decide these tradeoffs? Switzer. Environmental Politics. Pp. 139-158. Layzer. "Oil versus the Arctic National Wildlife Refuge." Chap. 5 in The Environmental Case. Pp. 102-126. World Commission. "From One Earth to One World." Lafferty. "The Politics of Sustainable Development." Daly. "Sustainable Growth: An Impossibility Theorem." Gore. "A Global Marshall Plan." Layzer. The New England Groundfish Crisis. Pp. 231-260. Some believe that the Earth cannot be saved untill humans recognize that they are a minor player in the natural world. Putting the Earth first--well ahead of human greed and desire--is the path of deep ecology. Can chaining yourself naked to trees or blowing up shopping malls save the earth? Layzer. "Ecosystem-based Solutions: Restoring the Everglades." Chap. 12 in The Environmental Case. Pp. 289-318. Foreman. "Putting the Earth First." Naess. "The Shallow and the Deep, Long-Range Ecology Movement." Dodge. "Living By Life: Some Bioregional Theory and Practice." Eckersley. "Ecocentrism Explained and Defended." End of term regulations require that the last assignment (other than the final exam) be due no later than today. Your paper may be submitted by hard copy or email to your TA. Switzer. Environmental Politics. Pp. 213-242, 295-310. Layzer. "Climate Change: the Challenges of Formulating International Environmental Policy." In The Environmental Case. Pp. 1-24, 209-237. Wapner. "Politics Beyond the State." Brecher, and Costello. "The Lilliput Strategy." Dobson. "Strategies for Green Change." Skolnikoff, Eugene B. "The Role of Science in Policy."